If you love a good word challenge, Word Pops combines Scrabble-style spelling with Tetris-esque movement. Your job is to spell words with your finger to stop bubbles from filling the screen. Just touch a letter bubble and slide your finger onto adjacent letters to form a word. As you spell words, new bubbles continually rise to the top of the board. Keep finding new words or you'll be overrun by bubbles and the game will end! As you play, you'll encounter special bubbles that can help (and sometimes hinder) you. Go for bonuses that earn up to five times the normal amount. Watch for special bubbles like Freeze, Explosion, and Mutate--they'll give you a leg up at crucial moments, but they can mess you up, too. Choose between scored and relaxed modes, depending on how intense you're feeling. Scored mode features Scrabble-style scoring, with more points awarded for less common letters, and increases the pace of the game as you go along. Relaxed mode simply lets you play--there's no scorekeeping and the speed remains constant throughout. You can adjust the speed in this mode, as well, in case you want to hone your chops. The game's natural touch interface, which is remarkably smooth and graceful, makes it easy to play this game for hours. 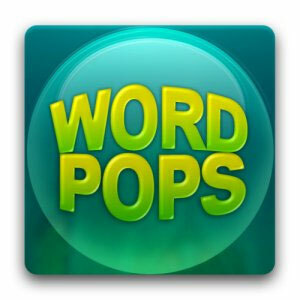 Challenge your friends to see who can get the highest score or create the most valuable word. Good luck!